"He does great things too marvelous to understand. He performs countless miracles." I just want to praise God and report that Kristen and baby Eli are doing very well!!!!! Oh, this little guy is so precious, and he just grows cuter and sweeter day by day!! 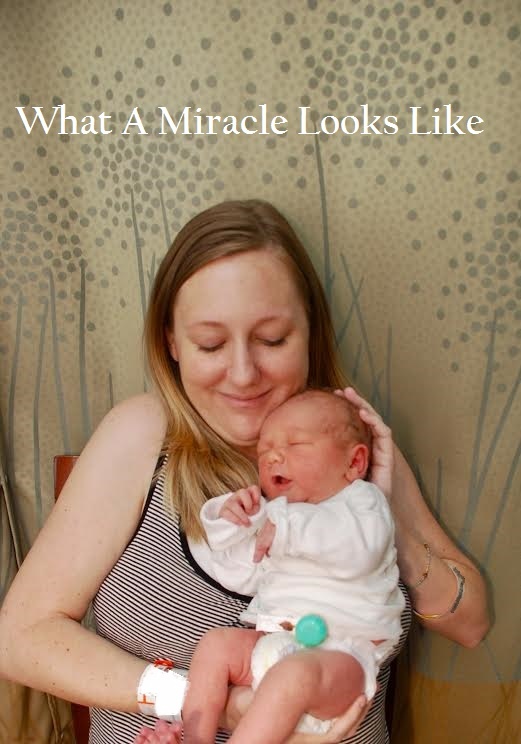 We cannot stop praising Him for this amazing miracle. And the look on the faces of his dear, sweet parents just melt my heart!!! Have you ever seen anything so precious in your entire life? This is one loved and cherished little baby boy!!!!! I tell you, I look back over the last several months and all of the worry and fear and trauma my dear niece has endured, and I just feel like I could never, in a million years, praise God enough! The outcome is exactly what we prayed for and believed God to provide. "Then touched He their eyes, saying, According to your faith be it unto you. And their eyes were opened..."
and not allow any more blood clots or complications. Our family is so appreciative of every prayer you have prayed and ways you have reached out to us during this awful trial. We love each one of you so much and praise God to have such an amazing support system. May He bless each one of you abundantly!!! you may be called upon to bear, but I just want to encourage you. but He is WITH you, through it all. We question God and ask Him why. We struggle, because even in our most doubt-filled moments, we still know and believe that He has the power to prevent hard things from coming into our lives, and that is one of the main causes of our confusion and disillusionment. so why in the world doesn't He do that? Why does He permit such? I do not, nor do I claim to, have the answers. I ask the same questions more often than I care to admit. I don't know the mind of God. His thoughts are so far above mine, that the two cannot, nor will they ever, be reconciled. But, this I do know. God never promised we would not go through difficult things, but He did promise to go through them with us. Even when it doesn't feel like it. Even when we cannot sense His presence. Even when things seem to only get worse when we pray. "...lo, I am with you always, even unto the end of the world. Amen." When I look at this picture, I see the end result of her suffering. who makes this face when his Mommy kisses his nose! There is a beginning and an end to every trial, my friend. The end result will be beautiful. God is now working on your behalf. Even though this season my be beyond difficult, this too shall pass. Please keep encouraged, always, and let me know how I can pray for you. I want you to know that as I compose this post, I am praying for every, single person who will ever read these words. I also wanted to let you know that the goal has been met for the Cooper family to pay off the remainder of Megan's funeral expenses!!!! Thank you, thank you, thank you to each one who made this happen! The family would like to share this message with you. "We, the family of Josh and Megan Cooper. would like to thank EVERYONE who helped in any way with Megan's funeral expenses. There are no words in our hearts that can express how thankful and blessed we are for everything that everyone has done for us through this time of sorrow. We truly appreciate the many prayers for the family, especially for Josh and little Sierra, the acts of kindness and sympathy, food, flowers, donations, cards, visits, phone calls, and kind words spoken to our family. We truly appreciate it very much!! May God bless each and every one of you." And, speaking of prayer, I now leave you with a very special picture and story, followed by a beautiful song sung by my all-time favorite singer, Ricky Skaggs. I first heard him sing on Moon Mullins' bluegrass program when I was 14. You just remember moments like that. when this voice came on the radio. It was the kind of voice that just makes you stop and pay attention. From that moment until this, he has been, and will always remain, my favorite. Several years later, Kevin and I fulfilled a lifelong dream when we went to Nashville for our honeymoon. While there, Ricky Skaggs was filming a "Hee Haw" episode, and we were so blessed to be able to attend as members of the live audience. After the show, he was kind enough to stop and talk to us and give Kevin time to take this picture. Let Ricky's song remind you that somebody's prayin' for YOU!! Congratulations and praise the Lord! Yes, amen, and amen!!! Thank you so much, Helene! Oh, those pictures are precious! I'm so thankful to God that everything went well for them. ♥ Love you, my sweet friend. Sweet Melanie! I have intended to write to you for so long. I am so sorry. I think of you often and trust all is well in your world. Lord willing, I will write soon. Thank you SO much for every prayer you have prayed for Kristen and little Eli. You have been such a loving support and encouragement through this. I love and appreciate you so very much! Oh what a beautiful family! Thank you, dear Laura! We rejoice and celebrate with you!! All glory to God for all He has done!!! This will be featured on Happy Homemaker Monday tomorrow! Wonderful! Thank you so very much for helping us spread the news of what our God has done! Oh what priceless pictures! That is one of the most kissable babies I've ever seen (well next to mine😊)Thank you for sharing. He's so happy too. Priceless treasures, indeed!! I will agree with you...that little face is just so adorable! I think he looks just like a cherub!! You have been such a dear support and blessing to us through this, Regina. Thank you ever so much, my friend. God bless you in a big way!! Thank you so much for sharing these sweet photos. He is the cutest baby and I can only imagine the happiness and thankful hearts of your entire family. Thank you so much, dear Betsy! Isn't he a doll? Oh, the relief we all feel is beyond putting into words. I will never forget how you stood by us through this. I know God heard the many, many prayers you prayed for dear Kristen and this baby. May He reward you abundantly and bless you with the healing you need. Praying for you, sweet friend. Oh, Cheryl, what a miracle. I'm so thankful things turned out as we prayed they would. 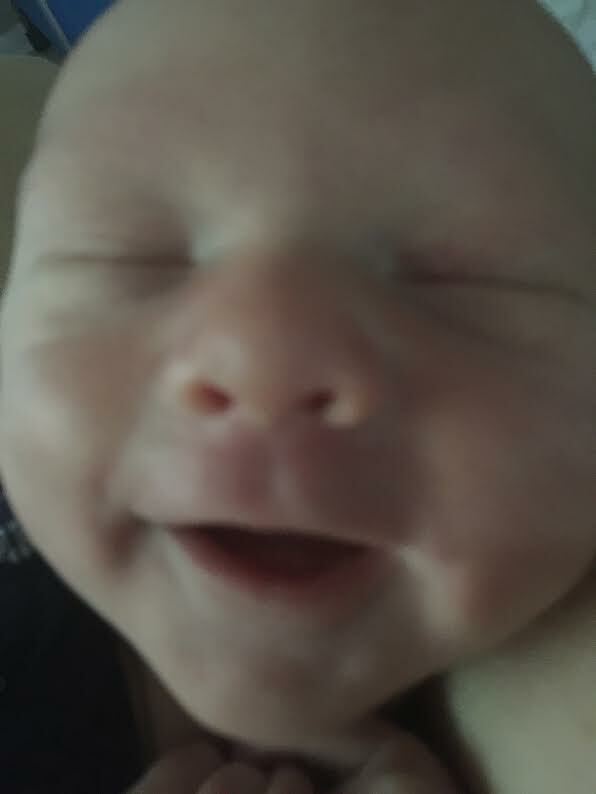 What a blessed little baby and family. Yes, praise the dear Lord, sweet friend! Thank you for praying so many times and for the love and concern you have shown us through this. God bless you!!! So lovely to see such a happy picture. Oh, thank you...it truly warms my heart!! I hope all is well with you and your husband today. :) God bless you! Oh, he surely is, Diana! And, you are surely a blessing, too! Praying for you and your little mother and so thankful for your support to us along this path. God bless you! A miracle, indeed. So happy for this little family. Continued prayers for good health for mom and baby. Hugs. Thank you so much, sweet friend! You have been so faithful to lift our burdens, and we are most grateful to you! May God bless you abundantly! You couldn't share more cheerful and joy-filled images, PRAISE GOD ! Sending blessings to you cherished, precious friend of mine, your lovely niece and your so wonderful baby, a true Gift from Heaven ! OH, thank you, dear Dany! Your prayers and constant concern and encouragement are precious gifts to us all! May God bless you so abundantly, sweet friend. Sending love and hugs to you! Isn't it just the most amazing thing when we get to see a miracle face to face! Oh the joy, the absolute marvel at such a miracle, it blesses my heart today to see the shine of love and delight on the parent's faces as they cradle their precious little boy in their arms! I pray that they are thankful and appreciative to the Lord for His mighty and miraculous ways and follow after the Lord with thankful hearts for the mighty miracle in their lives! What a glorious beautiful testimony they will always have to share about the hand of the Lord! 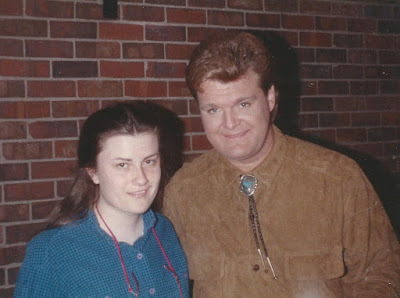 I enjoyed seeing the picture of you and Kevin and getting to meet Ricky Skaggs, he has a beautiful voice! Enjoyed hearing the video this morning, indeed so thankful for all the prayers that have been prayed for me, our God is so gracious to give us such a marvelous avenue of intercession in the midst of the difficult world we live in. Appreciate you dear friend, praying for you and your precious family! Thank you for all of your prayers and support and encouragement, sweet friend! They truly mean so much and are so appreciated! I know what you mean...it blesses my heart each time I see or think of all God has done for my dear niece and her sweet, little family! God bless you for the love and kindness you have shown us. Praise God.. God is so good.. seeing that perfectly adorable baby and parents is such a blessing.. I am so very happy to see this post.. Thank you so much, Arnica! God bless you. Thank you for posting these precious photos of Kristen's little guy and letting us see the miracle first hand!!!! I love the Lord and His kindness to reach down and save, heal and show us His amazing compassion. God bless this little family and the others we pray for. We give God all the glory! Big hugs to you, Cheryl. Yes, amen, and amen, sweet friend! As I was reading through the comments earlier, I had to cry and say, "Lord, You are getting a LOT of glory today!!" Oh, that is what I want to see! Is Jesus Christ glorified and praised. May He bless you greatly, dear Mary! I couldn't stop the tears Cheryl! I didn't even bother to read after seeing the photos. I would have to come back to read. Right now, I just want to give God all the praise due Him! �������������������������� Happy tears! Oh, sweet friend! That just touches me so deeply! I am surely praising God with you and SO greatly appreciate Him and all He has done! Thank you so much for caring so much and praying so many prayers and being such a dear friend and support to me. Sending much love to you across the many miles! Oh, YES!! We can't stop praising Him!! I am believing God to send you your own precious, sweet miracle...and soon! Love and appreciate you and praying much for you! Praising God with you for His miracle and for His mighty, wonderful presence with you all in the past few months. These songs are so apropos and beautiful. Thanks for posting the video. I'm so happy for your niece, her hubby and sweet, miracle baby Eli!!! Ricky Skaggs' song is just beautiful, and I'm enjoying it while typing away...thank you! What a joy to see precious Eli with mom and with dad! Praise God for His mercy and grace to grant this precious boy to come into the world and to keep his mommy safe. Praying for no more issues for Kristen! May God be glorified in all! Hugs! 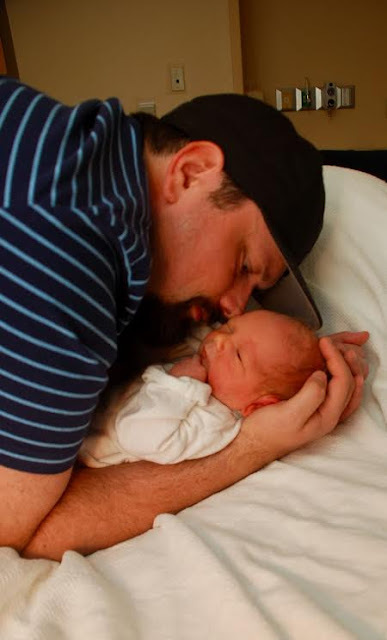 I am so overjoyed that everything went so smoothly during the birth of Eli. He's such a cutie! I have been praying for him and his mother, and was thrilled at reading your last post. Sorry I didn't get to comment on that one. What a great God we serve! He is so good all the time. I hope you're doing well, and your family. Oh, thank you so much, sweet Ashley!! We SO appreciate your prayers for Kristen and Eli! It was so nice to see you had visited today...you are such a dear blessing. God bless you, my friend! Give your Mom a hug for me! That is a wonderful way of wording it, Roseann! Blessed beyond measure, indeed. Thank you ever so much for your sweet visit. It brightened my day! God bless you! That is so neat that you met Ricky Skaggs. My mom listened to him...I know a lot of his songs, but don't actually own any. What an amazing moment for you, and how wonderful to have the picture to cherish! My dear, sweet friend, I have missed so much while being away from my blog. I just finished reading about Eli's entrance into the world and oh, what a PRAISE TO OUR HEAVENLY FATHER! I can't even describe the joy I am feeling right now knowing how God answered prayer. What a precious blessing. Thinking of you, dear one. Sending love and hugs your way! Oh, my! It was just such a dear blessing to see your sweet face and comment here today! I have missed you so much and can't thank you enough for all of your prayers and kindness to us throughout dear Kristen's ordeal. YES, God surely has answered prayer in a big way, and we are so grateful. You can certainly rejoice with us...you really helped to carry this burden! Sending love and hugs back to you and so very sorry about all your family is going through. I am praying for your grandmother and hope you get good news soon. LOve the song Cheryl and the message on prayer in it. I too am glad to read the good report on your niece and baby. always an encouragement when things turn our good. Blessings sister. Oh, my, I love that song, too...it makes me cry. Sending love and blessings back to you, sweet sister. :) So thankful for you and your support! Oh, thank you so much, Robin! I LOVE the verse you shared...it is one of my favorites, and I often quote it to the dear Lord in prayer. It is a blessed consolation when you are praying, and you really get to that point where you KNOW that He is hearing you. Praise His holy name! I so appreciate your sweet visit and kind words. May the Lord bless you! So awesome for Kristen and her family!!! That was a rough time for them... Still praying for them and you. Got to meet Ricky Skaggs? That's cool! He seems like such a genuine guy... not a bad banjo and guitar player either! Thank you so much for your continued prayers for them, brother. Kristen is having some problems and needs a lot of prayer right now. YES, it was really, really neat to meet Ricky! We will never forget that. You are right...he is genuine to the core. His wife, Sharon, is just as sweet and genuine. I wish now we had gotten more pictures that day and included her and Kevin, but another neat story is that they were selling their little girl's puppies outside the Hee Haw studio! So, I remember that we were trying to hurry and not be too intrusive or bothersome to them! Such a neat memory. He can tear up a mandolin, too! Amen! I love how amazing our Father is the true Healer!!! Congratulations and praise God for His wondrous acts. Thank you so much, and amen!! Oh sweet friend! These pictures are just precious!! Indeed, their joy leaps through the pictures! Thank you for the wonderful encouragement you always share within all your posts, but especially this one that even in the midst of trials, our God is faithful and will never leave us nor forsake us. I love the story about your honeymoon and the picture you shared! It is always such a blessing to stop by your sweet blog. And thank you so much for your email that you were thinking of me when I was on vacation. We got back today and enjoyed our time away. Oh, thank you so much for your precious comments and love and encouragement! I know you prayed so hard for Kristen and little Eli, and we are eternally grateful to you, sweet friend. I am SO thankful you had a nice time away...I thought of you so often and am so grateful God blessed you and kept you safe and let you enjoy your time. Sending much love and gratitude back to you!! !